Full of character and real life, the busy markets in Milan, Italy are an integral part of Milanese local life. They provide a great place to find bargains in Milan or just browse around the wide variety of stalls and enjoy the exciting atmosphere and local market banter. Milan's bustling markets range from the very large to the small, discreet collection of stalls, situated in small squares in Milan. They are held in many districts of Milan and provide a fun way to shop, for both experienced and novice bargain hunters alike. 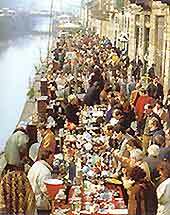 Every Saturday along the small lake of Darsena is the long established Fiera di Senigallia flea market. Here you will find many bargains, including clothes, military items, jewellery and much more besides. Held every Tuesday and Saturday morning, this huge market offers a wide choice of bargains. It has become the largest market in Milan and can become crowded at the weekend. It is most famous for fashion, including clothing and shoes. This collector's market is full of collectables, such as coins, stamps, cards, small toys and more. It is open every Sunday morning, near to the Piazza Cordusio. This open-air market in Milan is full of interesting curiosities and objects, period costumes, clothes, furniture, books, food and much more. It is open every Sunday from 09:00 to 13:00 and is often thought of as more of an open-air bazaar than a market. The Via Flori Chiari is one of the best antiques markets in Milan. It is held by the Navagli Grande on the last Sunday of each month, and also at the Via Fiori Chiari on the third Saturday of the month. Every Sunday morning from mid-March through to December, this open-air flower market is held. Located opposite the Palazzo Reale and next to the Duomo, it sells mainly flowers and small plants. Full of interesting objects and second-hand furniture, this Milan antiques market has many collector's items at reasonable prices. Early morning is one of the best times to enjoy this market, before it gets to busy - and this is also a great time to spot bargains before they are snapped up, This popular market in Milan is open on the second Sunday of every month, from 08:00 to 19:00. With over 400 stallholders, this market is one of the largest antiques markets in Milan and is located along the banks of the Naviglio Grande. Bargains include clothes, toys, books, furniture, jewellery and general bric-a-brac. The market is open on the last Sunday of every month, from 08:30 to 18:30. This Christmas street fair is held at the beginning of December during the annual celebrations of the Festa di Sant'Ambrogio and market traders sell a wide-range of goods, many ideal for Christmas presents. It is named after Milan's patron saint and has a particularly friendly and exciting, festive atmosphere. This traditional and well-known Milan flower market has been held for over 400 years by the Sant'Angelo convent. Held every year in April, on the Monday after Easter Sunday, the market lasts all day and there are also many handicrafts, books and food, provided by the monks.